This post discusses the most recent episode of The Good Place. 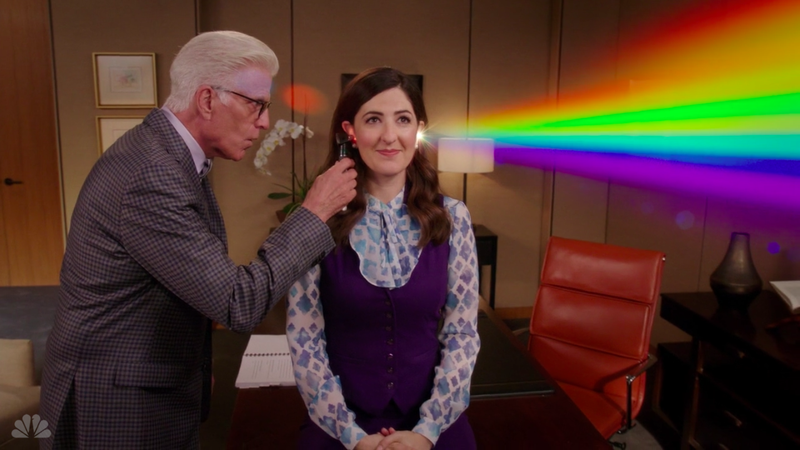 The Good Place is far and away the best comedy on network TV at the moment, in part because no other TV show on the air uses the entire screen for joke-telling the way The Good Place does. Bob’s Burgers comes close, with its revolving door of cleverly named storefronts, exterminators, and Burgers Of The Day; like that animated series, Michael Schur’s afterlife sitcom has several reliable sources for visual japes, but since many of its characters are immortal beings—and at least one of them possesses a comprehensive database of all information in the known universe—its palette is a little more expansive. Last night’s episode, “Janet And Michael” (the title itself a riff on siblings who also happened to be two of the biggest musicians in the world), made good use of two of the most prominent colors in that palette—let’s take a closer look, shall we? It’s a blink-and-you’ll-miss-it gag, practically engineered for today’s screencap-happy TV audiences. And it leads to the masterpiece of prop comedy below, which judging by the way D’Arcy Carden’s fingers are reflected in the metal, is an actual physical object that The Good Place production team has hopefully preserved, so that it may amuse generations to come. In a wide shot of the soon-to-be-opened neighborhood, you can make out some, but not all, of the restaurant names: The many-layered Custard’s Last Flan and Panna Cotta Da Vida leap out, as does A Few Pudd Men, but those crossed spoons with the purple banners beg for closer inspection. And “Janet And Michael” obliges, eventually cutting to this medium shot, in which the eponymous characters’ discussion and Michael’s oncoming breakdown are set against the backdrop of—ah ha—Puddington Bear, and an entirely different store that was hidden around the corner: Boyz N The Pudd. (Bonus, non-dessert pun, over Carden’s shoulder: Scents Memories.) Without pulling too much attention from the actual substance of the scene, the absurdity of the names and the concept get filtered into Michael’s panic and Ted Danson’s well-calibrated agitation. It’s a microcosm of The Good Place, multiple aspects of the show’s production—acting, writing, direction, cinematography, editing, set design, set decoration, post-production, and visual effects—working in harmony to create something that’s cute and clever from a bird’s-eye view, but gets smarter and weirder and more distinctly its own thing as it comes into focus. And it all ends with Danson making this face under this sign, a bona fide television legend reasserting his talent beneath a gleefully tortured allusion to a chilled dairy treat and a cartoon bird. Flan-tastic.